Are you in love with Italy and its culture? Would you like to take a break from your daily life and take a dip into the amazing Italian atmosphere? The Italian Book Club in English will return in 2019! 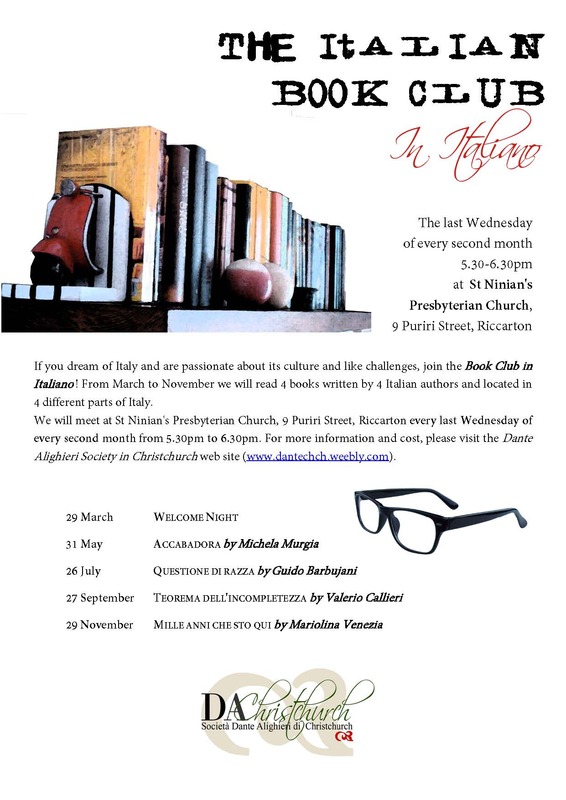 If you dream of Italy and are passionate about its culture, come and join the Italian Book Club. 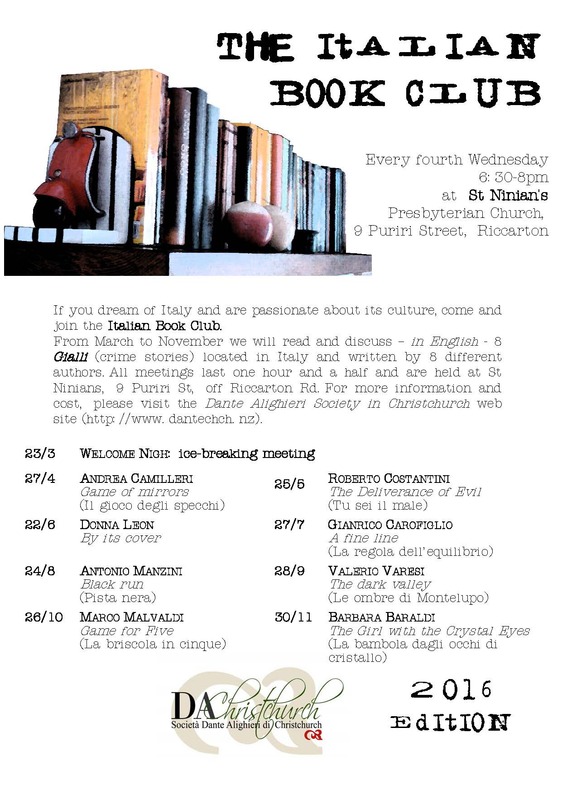 Later in the year we will read and discuss – in English – 3 books located in Italy and written by Italian authors. 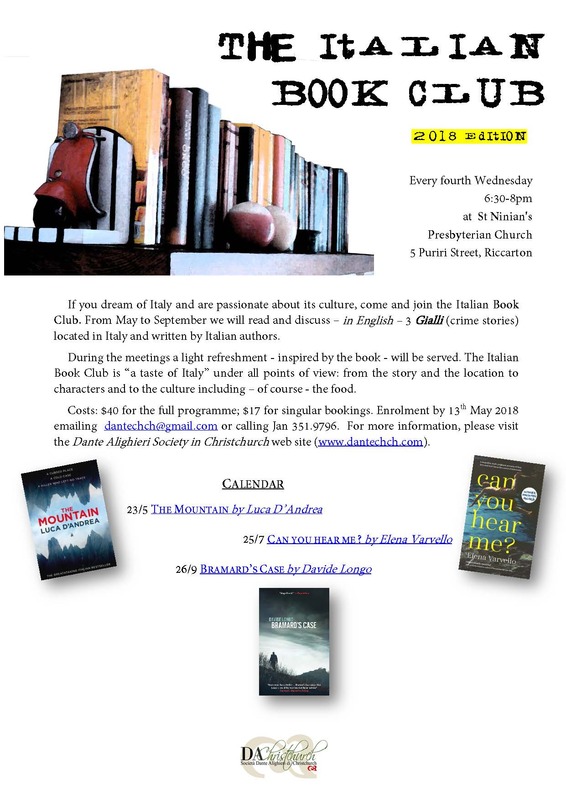 The Italian Book Club is “a taste of Italy” under all points of view: from the story and the location to characters and to the culture including – of course - the food, so at every meeting you will have the chance to try a traditional recipe inspired by the book. $40 for the full programme; $17 for singular bookings. Payment can be made online into the Dante Scuola account: 117800-0054463-11. Please give your surname and "Book Club" as payment information. Payment can also be made by cheque, made out to the Dante Scuola and send to the Treasurer, Mr Lindsay Serra, 21 Cairnbrae Drive, Prebbleton 7604. Please send an email to dantechch@gmail.com giving us your name, a contact phone number, and the reference "Book Club". ​All meetings starts at 6.30, last one hour and a half and are held at St Ninians, 5 Puriri St, off Riccarton Rd. ​Note - change of meeting from 29 November. Note - change of meeting from 29 November.